Appetisers and aperitifs: getting started with the information literacy cookbook; Feeding the masses: digital citizenship and the public library; Healthy mind, healthy body: digital literacy in the NHS; Information discovery stir-fry: information literacy in the commercial sector; Alone in the kitchen: when you’re the only one providing the service; Educating the palate of pupils and teachers: recipes for success in school libraries; Variety is the spice of life, or choosing your toppings with care: information literacy challenges in the further education sector; Information literacy beef bourguignon (also known as information skills stew or i-skills casserole): the higher education sector; Conclusion: coffee, cheese, biscuits and petit fours. 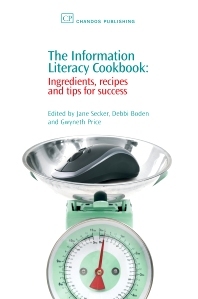 This book, aimed at an international audience, provides an overview of Information Literacy (IL) in practice; what it is, why it’s become so important in the library profession and demonstrates how librarians can cultivate a better understanding of IL in their own organisations. It uses the ‘Cookbook’ theme throughout to provide a more informal approach, which will appeal to practitioners, and also reflects the need to provide guidance in the form of recipes, tips for success, regional variations, and possible substitutions if ingredients aren’t available. This approach makes it easy to read and highly valuable for the busy information professional. It includes an overview of information literacy in higher education, the schools sector, public libraries, the health service and the commercial sector. It also includes contributions from international authors. Dr Jane Secker is Learning Technology Librarian at the Centre for Learning Technology, based at the London School of Economics. She is Chair of the Heron User Group and Association of Information Professionals in the Social Sciences (ALISS). She is the Conference Officer for CILIP Information Literacy Group and a founder member of the Librarians’ Information Literacy Annual Conference (LILAC). Debbi Boden is a Faculty Team Leader at Imperial College London. She is chair and a founder member of the CILIP CSG Information Literacy Group and a member of the Information Literacy Annual Conference (LILAC) Committee. Gwyneth Price is Student Services Librarian at the Institute of Education, University of London. She is Editor of Education Libraries Journal.